Variety is the spice of life and Cinnamon Coffee House presents an irresistible feast that features just that, this Deepavali. Come together for a great celebration as we have everything to entertain the family, and a little more to treat yourself to. From wholesome salads and soups to sinful nasi briyani, Cinnamon Coffee House offers fuss-free food served with a gourmet spin. 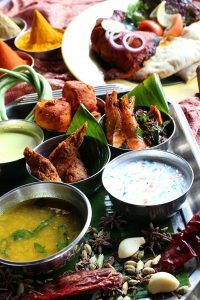 A spectrum of Indian delicacies such as the exquisite Nasi Briyani, crowd – pleasing Mutton Varuval, Chicken Tandoori, Meatball Korma, Rasam, Vadai Masala, Gulab Jamun, Laddu and Jalebi are tailored just for the occasion. Apart from Indian cuisine, Executive Sous Chef, Saiful Baharin also incorporates the joy of street food into the menu. The Satay is beautifully aromatic and the accompanying sauce is rich with peanut that has a tinge of sweetness. The Nasi Lemak is incredibly fragrant and the combination of its condiments with contrasting tastes and textures is hard to resist. The Mee Mamak, Roti John, Nasi Tomato, Beef Rendang, Sayur Lodeh, Seared Fish with Basil Cream and Pan Fried Shanghai Dumplings are commendable too.